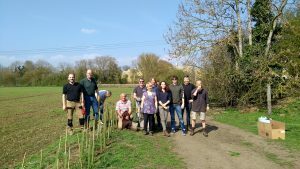 On a warm and sunny spring morning local volunteers, with permission of the farmer, set about planting a new hedgerow along a popular footpath in Fairford. 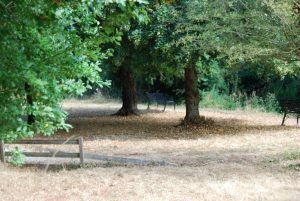 The area planted was along the footpath (Fieldway) behind the new Keble Fields development that leads to the walk around Lake 104 and the River. The day was organised and funded by Fairford Community Voice and expert support was provided by Farming & Wildlife Advisory Group South West. The day started by preparing the area to be planted. This took longer than expected due to the discovery of wire mesh fencing that was buried underneath the vegetation. Once this had been cleared, the line of the new hedgerow was marked out. The group was then provided with a demonstration of how to plant the bare-root plants to ensure they have the best chance of establishing, as well as how to support with canes and rabbit guards. After this, the volunteers enthusiastically set about the getting the hedge planted and this was achieved in a little over two hours. Teas and coffee were kindly provided by a resident of Keeble Fields and attention then switched to the existing hedgerow on the opposite side of the field. The hedgerow here had become a bit thin, with several large gaps. 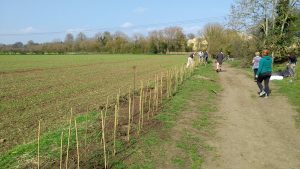 The volunteers infilled the gaps with new plants with the aim of creating a continuous hedgerow which will provide an improved habitat. While the group were grateful for the pleasant weather on the day, the plants themselves would have been thankful for the rain that fell in the following week, which was necessary to give them a good start. The plants used to create the hedgerow were a mix of native plants, typically found in the English countryside, including Hawthown, Hazel and Crab Apple. The variety of plants should provide food and shelter for a wide variety of creatures, many of which are in decline across the UK, including pollinating insects, farmland birds and Hedgehogs. 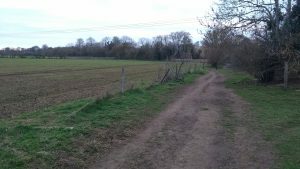 Once the plants have grown beyond the reach of rabbits, the guards will be removed, and in time we hope there will be an attractive hedgerow that can be enjoyed by both wildlife and people who use the footpath. 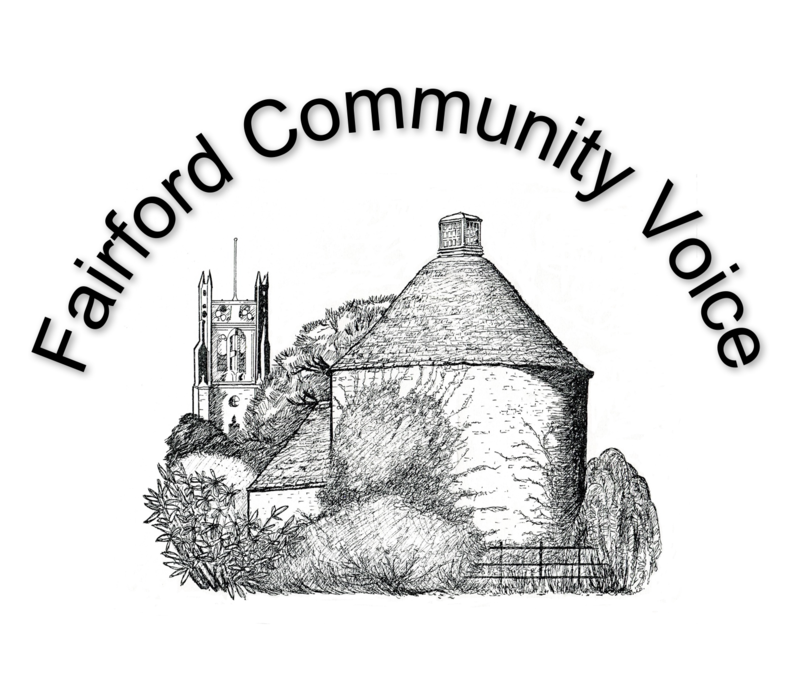 Fairford Community Voice will be undertaking further environmental work in and around Fairford in the future, so if you are interested in volunteering please contact Paul Taylor on paul.taylor43@sky.com or Malcolm Cutler on malcolmcutler214@gmail.com. Message from The Ernest Cook Trust regarding footpath closures. “The Ernest Cook Trust is pleased to have enjoyed a long standing working relationship with J S Wright (www.cricketbatwillow.com) and have been producing timber for the Cricket Bat market for decades. We have started harvesting more Cricket Bat Willow trees in the Pitham Brook area, near the River Coln, which will cause some temporary disruption to the Permissive Footpath. Notices have been displayed since the work started alerting members of the public to a temporary closure of the footpath. In the interests of public safety, the footpath will be closed for around 2-3 weeks (from 18 July) during the felling, and access will be restricted. This will also provide safe working conditions for the contractor. This area was designed and managed by Coln House School pupils. It will eventually be managed by Fairford Town Council but the transfer from GCC is not yet complete. It had got into a very wild state. 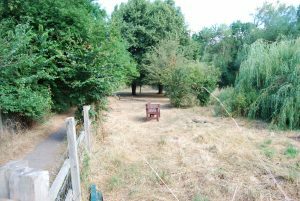 Malcolm Cutler, FCV chair, with some other well-equipped volunteers on a very hot day tackled the wilderness and it is now back into a usable picnic area, although a little parched. It is to be hoped that it will be made use of and appreciated. Well done to those volunteers. 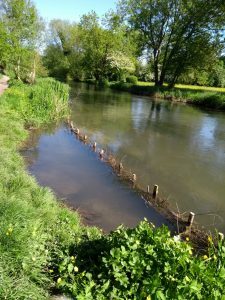 A group of mainly Fairford volunteers led by Patrick Dreyer of the Farming and Wildlife Advisory Group SW has recently (May) carried out excellent work on the River Coln near Dilly’s Bridge. The purpose was to protect and re pair the river bank. Work by FWAG SW volunteers also has carried out clearing work on the Snake Lane path.